I made an article on this. But, I will again tell the basic things. Search Engine Optimization(SEO) is the process of affecting the visibility of a website or a web page or a web search engine's unpaid results- often referred to as "natural", "organic" etc. 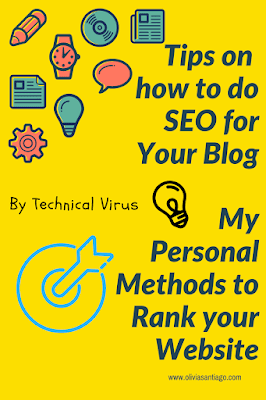 If you owned a blog then you have to do SEO for your blog. That's why I am here. I will help you with all your SEO problems and those solutions. Just believe me and support my work. 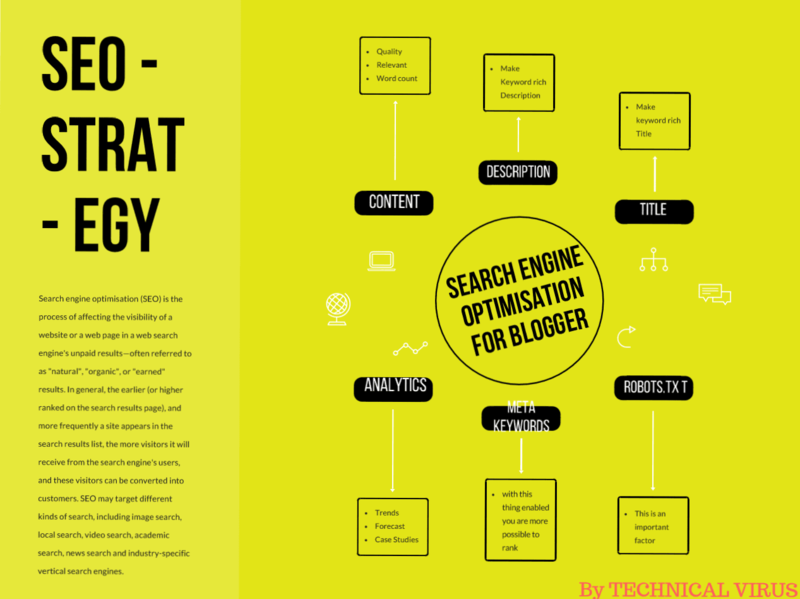 Before starting, here is a mind map of the Advance SEO strategies for your blog. I will discuss all of them. First, Title - Title is a factor for your blog. Unique and keyword riched title is always good for your blog. So, make sure you do it. Description - Description is another vital thing to rank your website on google. Make the description keyword rich. 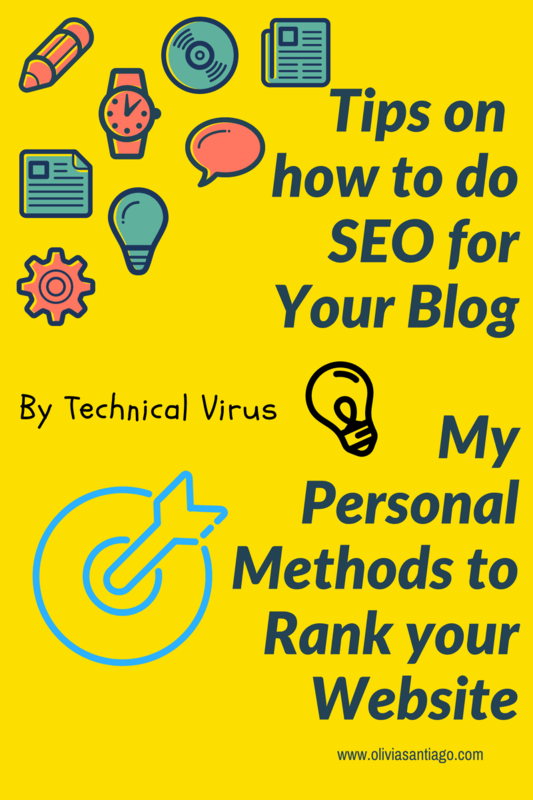 Meta Keywords - Those are the main thing for your blog. 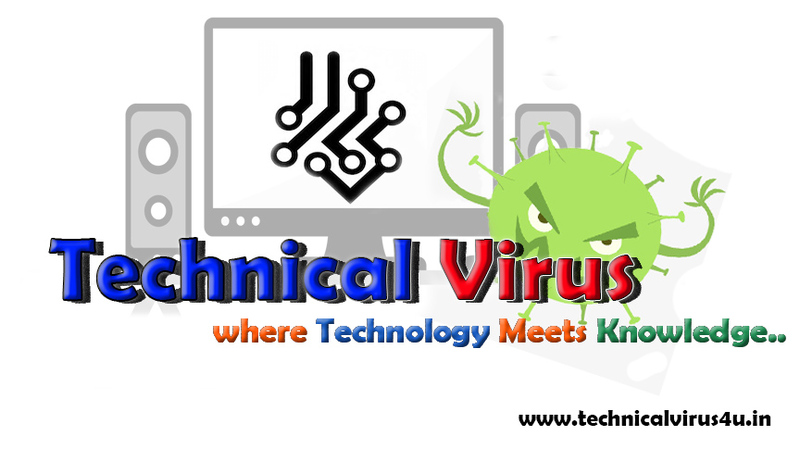 It is the meta keywords that help the google to find and rank your website on it. 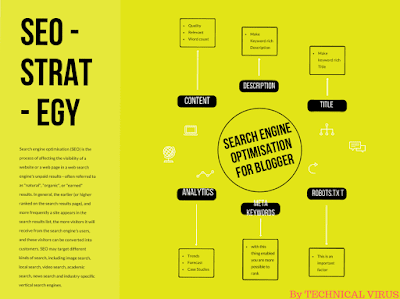 Use the main keywords that describe your blog into the meta keywords. Google Analytics - After creating your blog you have to connect with Google analytics. By doing that you will be one step closer to the SEO. Content - Content should be keyword riched. Use as many keywords as you want. After writing your content in the blogger, make sure to give a label, give search description and enable the custom robots tag. Just go there, enter your website address and enter. With the robots.txt file generated you will also be able to create a sitemap for your blog. After creating, copy the code and paste it in your blogger robots.txt section. Just enable it and paste in then save the file. And you are done. Some Advice: You have to look an eye on the images that you have been using. For Google rankings, it is a must to reduce the size of the images. In order to reduce the size of the images, many online png compressors are available there. One of them is TINYPNG. So, that was the main things to SEO for your blog. That's it for today. See you in the next article.